A few weeks ago, right after Easter here, we had a very snowy weekend so I decided to get some scrapbooking done. 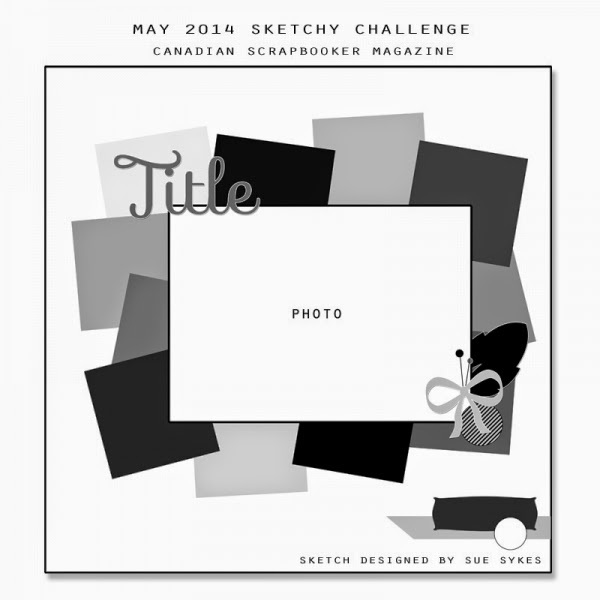 What better place to start than with the Sketchy Challenge at Canadian Scrapbooker's Magazine website?! I used the paper from the Tim Holtz Seasonal paper stash and cut out a bunch of the vintage Easter pics to frame my photos. Amie looked like she was enjoying her chocolate so much! The journalling card is by Jillybean Soup and the strips of paper by Fancy Pants Design. I used a strip from a piece of Jillybean Soup paper as my title. Hard to believe just a month ago it was so snowy!! I hope you will check out Canadian Scrapbooker's Magazine website - they have some wonderful sketches and inspiriation! So, two of my go-to blogs for inspiration and great challenges both had a challenge I happened to combine this week - Simon Says Stamp Monday Challenge has an Artsy Stamp challenge and Simon Says Stamp Wednesday Challenge has a Travel challenge. When I think of doing something Artsy, I can't help but think of Distress Inks, stencils, vintage stamps and a little mixed media. So, I combined all these elements, and the bicycle stamp and postage stamp fit the travel theme! I don't know how far I really would have wanted to travel on this particular bike, but it sure does look neat! I stamped the bicycle and postage stamp over the background, and I used my Postage Edge scissors to trim the right side of my card base. For the background I first used a Distress Ink in 3 shades of blue sponged over the Tim Holtz heart stencil, and then I painted over the ink with Perfect Pearls mist to give a shimmer. Next, I layered on the Tim Holtz sunray stencil and sponged over it with Chipped Sapphire. I added an inspiring Tim Holtz stamped sentiment to the inside and another layered postage edged cut. Be sure to check out this site - she has amazing crochet patterns, kids crafts and recipes! I hope life is good for you! Ok, so I just had to make one more card with this cute balloon stamp!! It is a Little Darling's stamp, which was included in my Card of the Month kit from my LSS, and I followed the Tall & Skinny sketch from Mojo Monday for this week. I used a combination of paper-piecing, Distress Markers, and coloured pencils to colour in the image and popped her up with foam dots after fussy cutting. I had to pull out my Artsy stamps for my travel themed sentiments - The Journey is from Tim Holtz and the Explore ticket is by Kaisercraft. I'm not sure where the postcard stamp came from. The pretty floral paper is from Jillybean Soup. I hope you are all enjoying your week so far! I have been having fun getting some cards done - unfortunately I have not got the laundry done, lol. Oh well, I guess it'll still be there tomorrow! I bought the cutest little stamp last week that was included with my local scrapbook store, Scrapendipity's Card Of The Month Kit! The first card was the one made with the kit, following the directions that were included. I did, however, stamp on watercolour paper and use Distress Markers to colour in the parts of the image that weren't paper-pieced. I used a Simple Stories 6x6 paper pad for the cloud background to create the next card. I love this cloud paper! And, for the last card I used a piece of Fancy Pants Design paper for the background. I thought the I<3U was too cute and I made sure to place it in the bottom right corner. 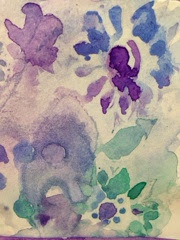 I used a technique Jennifer McGuire showed in the Watercolor for Cardmakers class at Onlinecardclasses.com, and used Perfect Pearls mist instead of water and Distress Markers to watercolour some of the areas I wanted sparkly. Of course, I had to enter it into Simon Says Stamp's Wednesday Challenge - Travel! Who wouldn't want to take a balloon ride to get to their destination?! Last month the swap group I belong to were challenged to create 4 mixed media cards based on our initials and the initials of our partner. My partners initials are MW, so I used M for Mermaid. I used the Create a Critter cartridge for the fishbowl and water, sand, and plant layers. I added some sparkly paint and white heat embossed the sentiment. The mermaid and starfish were stamped and coloured with Distress Markers. W is for Watercolour. I used the Art Philosophy Cricut cartridge to cut out a watercolour background and a matching frame from Core'dinations cardstock. I stamped on the background after adding watercolours and then added a dolly stamped image from Crafty Secrets, which I paper pieced. K (my first initial) is for Key. I die cut the scalloped oval with the Art Philosophy Cricut cartridge and then embossed it and highlighted it with Distress Ink. I used the Gypsy Wandering Cricut cartridge to cut the key and keyhole and added ribbon, paint, Tim Holtz chit chat stickers, a key charm and a watercoloured stamped image from CC Designs. Y (my last initial) is for Yarn - another crafty thing I love! I cut the ball of yarn using the Kate's ABC's Cricut cartridge and added a Simple Stories paper sentiment, a crocheted flower dyed with yellow paint, twine, a button and a coloured digi stamped image from Pure Innocence. Happy Monday and welcome to another Monday challenge! To qualify for the prize, be sure to use at least 1 Cricut cut on your project and if it's not obvious, let us know what cartridge you used. For me, Spring truly is represented by flowers :) When I see the tulips finally poking through the ground, ready to open up, I know Spring is here! We have had a very long winter here in Alberta, Canada, and just two weeks ago a full weekend of snow. I am ready for warmer weather to be sure. 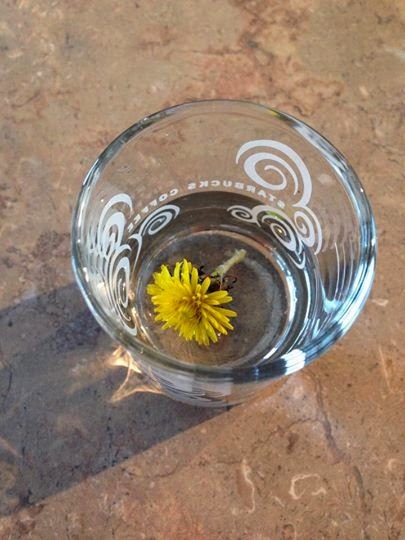 I noticed some flowers ready to bloom outside my window today, but the best thing about Spring is the first dandelion of the season, brought in by my 2 year old, who handed me this little yellow flower saying "a flower for you, mommy". I wouldn't trade that for anything! For my project this week I used the Bloom Cricut cartridge to create a birthday card. I created a background by shading watercolour pencils over watercolour paper and then painting with a waterbrush to blend the colours together. I layered the cuts for the trellis and vine with flowers over top. The stamped sentiment is from CTMH. I painted the butterflies, cut from the Art Philosophy cartridge, and then drew on flutter lines with a black pen. Inside, I cut out Celebrate Spring from the Bloom cartridge and cut off the 'Spring' part of the die cut. Be sure to check out the other amazing projects by the Design Team at FCCB and enter your own Flower project to win a fun prize!! 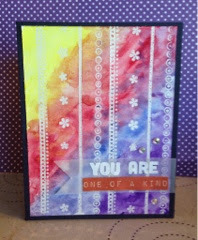 Having so much fun with the Watercolour For Cardmakers class at Onlinecardclasses.com! This card uses the techniques shown by Kristina Werner. I first embossed my watercolour paper with Crystal embossing powder, which is clear with a little glimmer, using 4 border stamps from CTMH. Then I used watercolour tubes to pool colours onto my paper, blending a little between each colour application. 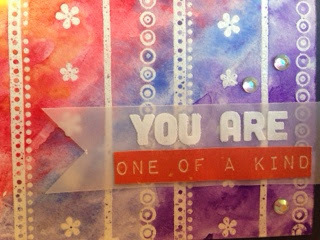 I stamped the 'You Are' from Simon Says stamp and heat embossed it with white embossing powder on vellum and cut out a sentiment from a paper pack. I layered my background on a black card and added some Hero Arts gems. I could create these backgrounds all day! It makes it so easy to layer on a sentiment and feeds my need to get a little messy too! 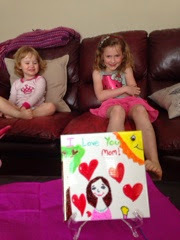 I hope you all had a wonderful Mother's Day weekend! 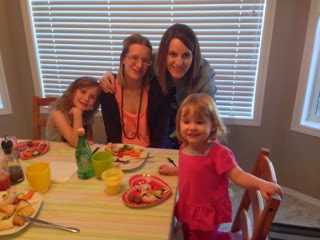 I felt truly blessed to have a lovely day with all 3 of my girls. 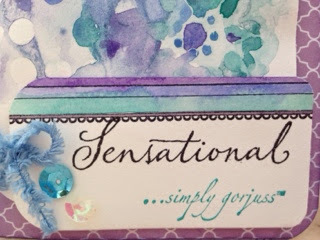 Lovin' the Watercolour For Cardmakers class at Online Card Classes! This card uses the technique of inking up an acrylic block with Distress Ink, misting it, and pressing it onto watercolour paper, overlapping each colour slightly. I mounted my background on a white cardbase with foam tape to give it some dimension. I was able to create this fun background using just 5 different supplies!! 1) Distress Inks 2) Die Cuts 3) Stamps 4) Watercolour paper and 5) Cardstock. I stamped with the Coffee Stain CTMH stamp set and used a Spellbinders Die for the tea pot and cup. Erica had to show off her own project using Distress markers and watercolour paper. Second day of Online Card Classes Watercolour For Cardmakers class and I'm getting to my first card! 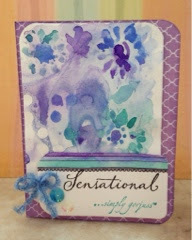 Jennifer Rzasa demos the techniques to create this card and it was fun and quick to do. I actually watercoloured through a Dylusions stencil to create the flowers, after creating a watercolour wash background using watercolour paint tubes from Michaels. I used some stamps from a Gorjuss set and CTMH to create my tag. I used Jillybean Soup, Simple Stories and Fancy Pants Design patterned papers from 6x6 pads - love them! They are so easy to work with on cards :). I added some butterflies cut with the Art Philosophy Cricut cartridge, inked with Distress Ink and layered with a Hero Arts gem for bling. The fantastic window stamp set is from Mark's Finest (our sponsor!!) and I layered it over the cloud paper. I cut out the Happy from the Straight From the Nest Cricut cartridge, using black cardstock. Inside I attached the birthday cut from the Simply Sweet cartridge. Please come join us at the FCCB blog to view all the fantastic projects by the Design Team and enter in your own for a chance to win a wonderful stamp set! I'm a mom of 3 beautiful girls, who LOVES crafting (scrapbooking, cardmaking, sewing, crochet...), decorating, and organizing. It's hard to find time, but a little creativity each day goes a long way to making my heart happy! Use code DTKARLA to save 10%!! Kitty Bee Designs Digi Stamps!